1491 Hope St, San Jose, California, U.S.A. Welcome to Boy Scouts of America Sea Scout Ship #300, in Alviso (San Jose), CaliforniaAlviso. or 13 and completing 8th grade, are welcome to consider joining. This webpage is a work in progress, so please check back soon for much more information. Sea Scout Ship 300 (SSS Spartan) was founded in 2016 to provide Silicon Valley youth the opportunity to develop character and leadership through aquatic activities along the San Francisco Bay. The ship's name signifies the unbreakable spirit of the Sea Scouts through their adventures on land and water, while paying homage to the influence of San Jose State University on rising industries throughout Silicon Valley. As the Chartered Organization, the South Bay Yacht Club recognizes the importance of training young adults to become future leaders and has graciously offered their facilities and resources to support this cause. Among our various activities, the SSS Spartan crew has learned kayaking, sailing, cruising, seamanship, and more. Our Sea Scouts have even put their aquatic skills to the test by participating in regattas and competing against other Sea Scout ships in the San Francisco Bay Area. Additionally, we serve our local community through conservation projects, veterans affairs, and public events. We even offer opportunities for local Scouting units and the general public to kayak along the Alviso Slough, giving our Sea Scouts the chance to teach others what they have learned. Each of these activities help the SSS Spartan crew grow in the ideals of Scouting, but it's also important that they have fun on the water! The element of water makes Sea Scouts unique. 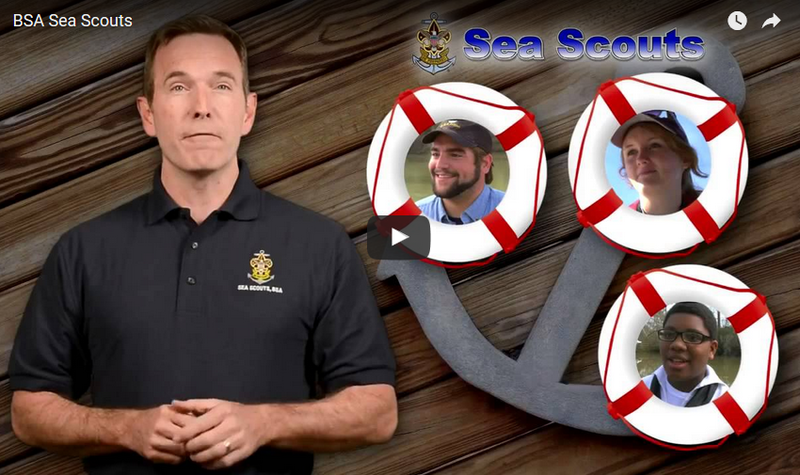 Sea Scout units use a variety of boats, from outboard motorboats to large sailing yachts. Sea Scouts belong to a world that is distinct from anything on shore, and they have their own language and customs. The water is not a place for the unwary, and the Scout motto, "Be Prepared," is imperative. The challenge is taking a vessel from point A to point B while being ready for whatever may be encountered along the way. Crewing a vessel involves sharing the duties of helmsman, navigator, lookout, cook, sail handler, or engineer. Outings on a boat offer new destinations in the morning and the changing scenery of a new harbor by evening. Every event is an adventure. Sea Scout programs are run by the youth members. Elected officers plan and conduct the program. Being part of the vessel's crew teaches teamwork. As experience is gained, more opportunities arise to contribute to the leadership of the unit. At quarterdeck meetings, ship's officers work together to plan and evaluate the ship's program. Leadership skills learned in Sea Scouts last a lifetime. Sea Scouts give service to others. Sea Scouts have been of service to hundreds of communities across the nation. Service can be expressed in individual good turns to others or in organized projects involving the crew or the whole ship. In rescues at sea, or facing emergencies on shore, Sea Scouts have saved lives and property. Sea Scout service puts citizenship into action. Sea Scout advancement rewards individual pursuits of excellence. Each level of advancement marks growth as a seaman and a leader. 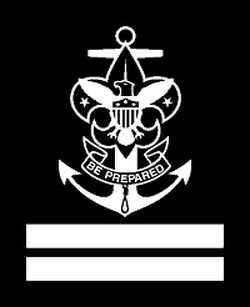 The highest rank a Sea Scout can earn is the prestigious Quartermaster rank. Seafaring has traditions that go back hundreds of years. Sea Scouts have adapted these traditions to the Sea Scout program and have created traditions of their own. 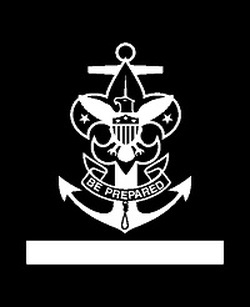 A youth must be 13 years of age and graduated from the eighth grade or be 14 to join Sea Scouts. You can stay in Sea Scouts until you are 21 years of age. For over 100 years Sea Scouting has promoted better citizenship and improved members’ boating skills through instruction and practice in water safety, boating skills, outdoor, social, service experiences, and knowledge of our maritime heritage. Sea Scout units– called ships- are established all across the country on oceans, bays, rivers, and lakes. They provide limitless opportunities and exciting challenges that you won’t ﬁnd anywhere else. Sea Scouts is a place to grow and learn, ﬁnd adventure, and build long lasting friendships. Sea Scouts receive training in seamanship and leadership. From ship meetings, long cruises, a USCG sponsored Safety at Sea, to SEAL (Sea Scout Experience Advanced Leadership) training, you will be learning every step of the way whether you realize it or not. Striving for Apprentice rank, active Sea Scouts learn ideals, courtesies, procedures, and responsibilities, and how members of a ship are organized and uniformed. Basic swimming and beginning seamanship skills are required, as is knowledge of safety, emergency procedures, and Safe Swim Defense. Sixteen hours of service in ship projects, activities, or equipment maintenance fill out the requirements. 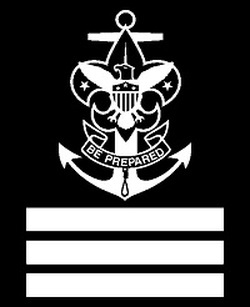 Active Sea Scouts attain Ordinary rank through additional service, knowledge of the Sea Scout emblem, U.S. flag etiquette, and land and sea protocols. Successful candidates will participate in strengthening ship membership, serve as an event chair, complete quarterdeck training, pass the Swimming merit badge requirements, and qualify on various safety and emergency procedures, drills, communication methods, and Safety Afloat. They learn about the galley, build on seamanship and boathandling skills, and learn about anchoring, piloting and navigation, and related regulations. Overnight cruise planning and participation provides for skills application, and completing three electives broadens horizons. To achieve Able rank, Sea Scouts master ceremony presentation and demonstrate knowledge of maritime history. They also teach others—perhaps Boy Scouts and Venturers—about the program and fulfill leadership responsibilities. They must pass the Lifesaving merit badge requirements and develop further expertise in safety and first aid. There is a continued progression in seamanship, boathandling skills, anchoring, and piloting and navigation, as well as a deeper understanding of maritime environmental issues. 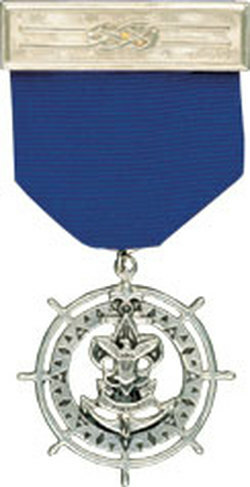 The Sea Scout Long Cruise badge is required for Able, as is completion of three electives. The highest award for Sea Scouts presents a challenge that, when met, will affect a young person lifelong. The Quartermaster candidate must think analytically about how the program is delivered and supported, while developing a deeper understanding of Scouting ideals. Most requirements represent intensification of what was learned for previous ranks, but with significant additions in the Quartermaster service project, cruise, and study of weather and forecasting. The cruise involves taking long-term command of a vessel and crew and conducting critical drills.